One of River's most favorite books is Mike Mulligan and His Steam Shovel, written by Virginia Lee Burton. This book is old … written in 1939, and takes the reader back to what feels like a much simpler time. The story, without giving it all away, tells the story of Mike Mulligan's love for his Steam Shovel, Mary Anne, and how he found a way to save her from the junk yard when the steam engines were replaced by gasoline, electric, and Diesel shovels. We've read this book over and over, so much so that River can read most of it by himself, because he's memorized it. 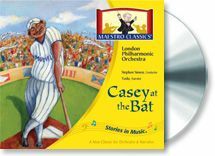 River and I, and the rest of the kids, reviewed two Maestro Classics musical CD's; Mike Mulligan and His Steam Shovel and Casey at the Bat. Of course River was thrilled! The musical, educational CD's are designed to bring the stories to life while presenting music lessons and teaching children to be active listeners. The music adds a new level to the poem. and gives it even more life. Following the telling of the story and playing of the music the narrator provides information about the author and the origins of the story. The next selection on the CD presents a piece by the Michigan State Marching Band. The CD goes on to teach the listener how music is used to create suspense, mood, and how music brings life to a piece. The CD ends with another telling of Casey at the Bat, this time with instructions to listen for the musical enhancements used throughout the telling of the poem. Now that we've listened to the poem and the rest of the CD the kids and I are excited to go and watch a minor league game, and are curious to see if any batter gets the same reaction from the fans that Casey did, and if their turns at bat will end as Casey's did! 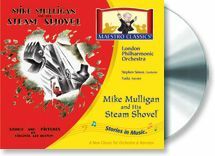 The Mike Mulligan and His Steam Shovel CD begins with the telling of the book Mike Mulligan and His Steam Shovel set to music by the London Philharmonic Orchestra. The music does so much to bring the listener to the edge of his seat, waiting to see what happens to Mike and Mary Anne. The second section of the CD tells about the author, Virginia Lee Burton. Section 3 provides a song about Mike Mulligan. Then we were told about the music, with the narrator breaking it down and teaching about each individual section of the story and music, explaining why certain music was used in certain places and what music was used in certain sections. The CD ends with another presentation of the Mike Mulligan story and music, allowing the listener to listen for what they've learned. Overall, we really enjoyed the CD's. The kids and I learned a lot about the stories, the authors, and the music. We were not very familiar with orchestral music, and really enjoyed expanding that horizon. The stories were relayed in a very interesting manner. Our attention was held throughout the CD's. We did run into problems with the volume of the CD's. With each new segment, and often within a segment, I was raising and lowering the volume quite a bit, which got frustrating. The CD's are geared towards children ages 5 to 12 and their parents. River, at 5, was just the right age for these stories set to music. Adam and Kaden, at 12 and 11, weren't quite as interested as River but enjoyed hearing the CD's, particularly Casey at the Bat. Ian and Mia, ages 16 and 14, were content to listen to each CD, they did discuss the information afterwards and found it very interesting but were ready to go back to a more "current" radio station after hearing each CD once. Maestro Classics Mike Mulligan and his Steam Shovel and Casey at the Bat are available at the Maestro Classics Store for $16.98 each. Both CD's are also available as downloadable MP3's for $9.98.